Description: Fillmore & Western. #14 parked in the Fillmore & Western / Santa Clara River Valley Railroad Historical Society yard. *Steam engine #14 is a 2-8-0 Baldwin built in 1913. The locomotive was purchased by Fillmore & Western in December 1999 from Dodge City Railroad in Dodge City, KS. Approximately 50 volunteers were involved in the restoration of #14. Restoration was completed in December 2010 with a special commemorative journey on January 2, 2011. Description: Fillmore & Western. #14 stopped at the loading/unloading area in the Santa Clara River Valley Railroad Historical Society yard during RailFest 2011. 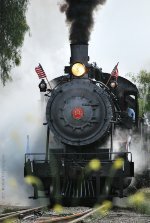 *Steam engine #14 is a 2-8-0 Baldwin built in 1913. The locomotive was purchased by Fillmore & Western in December 1999 from Dodge City Railroad in Dodge City, KS. Approximately 50 volunteers were involved in the restoration of #14. Restoration was completed in December 2010 with a special commemorative journey on January 2, 2011. Description: Fillmore & Western. 14 steam engine westbound after exiting the tunnel. #14 parked in the Fillmore & Western / Santa Clara River Valley Railroad Historical Society yard. *Steam engine #14 is a 2-8-0 Baldwin built in 1913. The locomotive was purchased by Fillmore & Western in December 1999 from Dodge City Railroad in Dodge City, KS. Approximately 50 volunteers were involved in the restoration of #14. Restoration was completed in December 2010 with a special commemorative journey on January 2, 2011. Description: Fillmore & Western. #14 westbound approaching Pole Creek. *Steam engine #14 is a 2-8-0 Baldwin built in 1913. The locomotive was purchased by Fillmore & Western in December 1999 from Dodge City Railroad in Dodge City, KS. Approximately 50 volunteers were involved in the restoration of #14. Restoration was completed in December 2010 with a special commemorative journey on January 2, 2011. Description: Fillmore & Western. #14 steam engine westbound just before exiting the tunnel. *Steam engine #14 is a 2-8-0 Baldwin built in 1913. The locomotive was purchased by Fillmore & Western in December 1999 from Dodge City Railroad in Dodge City, KS. Approximately 50 volunteers were involved in the restoration of #14. Restoration was completed in December 2010 with a special commemorative journey on January 2, 2011. Description: Fillmore & Western. 14 westbound passing the depot on its way back to the loading/unloading area during RailFest 2011. *Steam engine #14 is a 2-8-0 Baldwin built in 1913. The locomotive was purchased by Fillmore & Western in December 1999 from Dodge City Railroad in Dodge City, KS. Approximately 50 volunteers were involved in the restoration of #14. Restoration was completed in December 2010 with a special commemorative journey on January 2, 2011. Description: Fillmore & Western. 14 (steam engine) idling in front of the depot with 101 (streamliner) parked in the yard. Description: Fillmore & Western steam engine # 14 eastbound stopped on the Metrolink line at the west leg of the Montalvo wye. Description: Fillmore & Western # 14 eastbound stopped on the Metrolink line at the west leg of the Montalvo wye with AMTK 507 on the rear of the Pacific Surfliner northbound on the Union Pacific main line. Description: Fillmore & Western # 14 blowing off a little steam while stopped facing eastbound on the Metrolink line at the west leg of the Montalvo wye. Description: Fillmore & Western #14 eastbound on the Metrolink line at the west leg of the Montalvo wye approaching the US-101 / Ventura Frwy overpass.